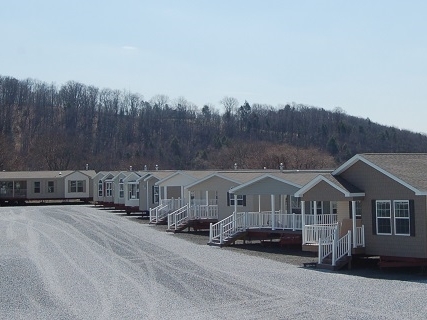 We invite you to visit us in Pine Grove, PA, where you can enjoy a self-guided tour of our model homes and Design Center. We know that a new home purchase is a big decision, so we aim to make it easier for you to gain ideas, decide what best fits your needs, and select colors and options. Our staff makes every reasonable effort to answer substantive questions pertinent to the home (from bottom of the floor to the peak of the roof), but because we are merely a manufacturer, we cannot provide more general guidance on homebuilding. Accordingly, we are not able to answer questions regarding costs. See your local retailer for more information. In additional to our weekday hours, we are open one Saturday per month. On Saturdays, we offer a guided factory tour at 10:45 a.m., which generally lasts about one hour. No reservations are necessary. We reserve the right to close the model home village, at our discretion, during inclement weather such as snow/ice. We recommend arriving early in the morning to maximize your visit (including the factory tour at 10:45am); our model homes CLOSE at 2pm to ensure that our personnel can enjoy weekend time with their families. Please keep in mind that this closing time is absolute; we hope you visit us, but we will close and lock the gates to our campus promptly at 2:00 p.m. regardless of all circumstances. Thank you for your understanding and cooperation; we look forward to seeing you! Pleasant Valley is pleased to open our models on select Saturdays to accommodate your interest in our homes. Please keep in mind that we are a manufacturer and cannot provide site-specific information, including pricing information. Our personnel volunteer to come in on Saturday to assist with our weekend guests. We are happy to answer any of your questions and assist you in any way possible.